Awoke to snow and blowing snow this morning (as forecast, believe it or not! ), and sighed with pleasure. Sometimes, on a Sunday, I just want to have a quiet day at home, not trekking 43 km. in to church and back...just writing Morning Pages, reading Morning Prayer, and making a leisurely start to my day. Today, I was blessed to be able to do just that! After breakfast and some 'net travel, I moved into my 'sewdio' and finished this, complete with branches and shadows. 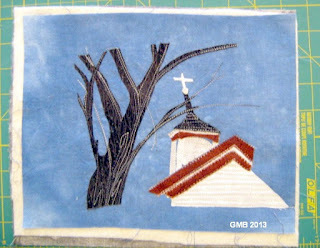 For those of you interested in the nitty-gritty of the process, the additional branches (compared to this) were done with simple black 50-wt cotton thread, along with the last of the quilting of the tree trunk. 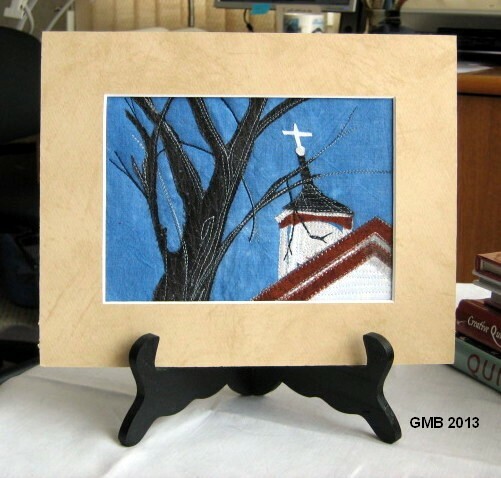 The shadows on the roof (bottom right) were created with MistyFuse to attach 2 layers of fine tulle -- a bit of grey and a bit of brown -- and a touch of InkTense pencil (black) over-laid with a hint of dilute white acrylic craft paint (this last in the white area between the two roof sections). And because one of you asked: yes, the building was assembled from little pieces of fabric and fused with Wonder Under. The tree is also fused onto the background (a piece of my own hand-dyed muslin), but it's all-of-a-piece except for the thread-painted branches. The roof of the bell tower and the cross were the toughest because of the angle at which the original photo put them, and because they were so **!! @@ tiny. On the knitting front, there was no rescuing that poor camisole. Taking in the full amount of excess fabric through the back might have worked...but in the end, the entire piece was made at least two sizes too large for me. Part of it was a gauge problem -- the punishment I get for not swatching (I intensely dislike swatching, but as in over 50 years of knitting this is only my second "disaster", I'm not about to start now) -- and part of it was that I simply selected too large a size for my body. Twenty pounds have left my frame since I began that piece, so I guess it was inevitable! No worries, though! I have attached a yarn label to it (it's silk and cashmere), and will give it away. I have enough of the yarn left over -- almost 4 full balls -- to make it again (swatching this time) or to make something completely different, which is likely what I'll do. I've resolved not to let it bother me and to move on to my next UFO, which is coming along nicely. It's a sleeveless turtleneck that I began ??? ago using "Piazza" from Schachenmayr Nomotta -- a yarn that is now discontinued, but of which I bought plenty from elann.com back in the day. It's a cotton blend, and the colourway is a deep coral cotton twisted with white synthetic for a bit of shine. The back was long finished, and I am making my way up the front. The pattern I'm using was free from elann.com but I can no longer find it on their website: the Gedifra Korfu Sleeveless Turtleneck. It's a very pretty open-work pattern with simple construction and this time I'm sure it'll fit, because the size is based on my current measurements, which I must have had before I gained those 20 pounds! Resolve leads to reward, right? My reward for finishing the turtleneck and a third UFO (a pair of cabled fingerless gloves, of which the first is done) will be to start a new project. I have just enough Araucania Atacama to make the "Windward" shawlette/scarf with I purchased last month from designer Heidi Kirrmaier's Ravelry shop. I got this yarn on sale at Knit & Caboodle in Canmore some years ago (2007?) while on a retreat with the Gillihook Heritage Knitters' Guild to which I belonged at the time. It's in a wonderful raspberries-and-cream colour-way, perfect for the coming spring. Thirteen lines done and 10 to go till this pattern row is finished! The snow has stopped but it's still breezy. After the sampler, I know I need to go out and do some shovelling if I'm going to get into Lacombe tomorrow -- and from there to Red Deer to give my sweet little car its regular maintenance service and oil change! Have a lovely rest of your Sunday! Too bad about the camisole! 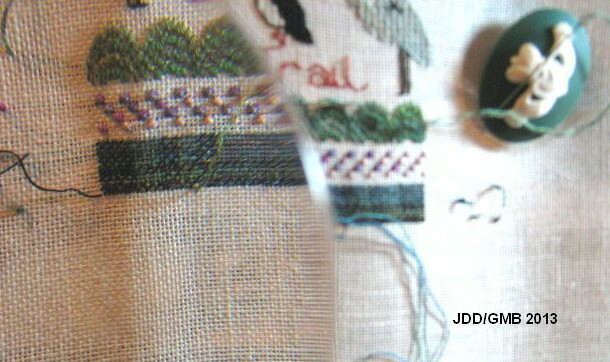 You could cut it up if you dare, into another piece of textile art. Though someone else might appreciate wearing it more. Sometimes it goes that way. And your little church steeple piece is very attractive. All that knitting and creating, my oh my. So talented. Great little church quilt. Love the Yarn.